OS grid reference: SH 4854 6243. The fort of Segontium lies in a well-defended position at the tip of a ridge between the rivers Seiont and Cadnant, some 150 feet above sea-level, commanding wide views of the surrounding area. Today the remains of the Roman fort look down over Caernarfon Castle. The fort lies on the A4085 road to Beddgelert on the outskirts of Caernarfon. The name ‘Sego’ is Celtic for ‘strong’, while the Roman name Segontium means ‘forceful river’; the name may, therefore, have links with the names of the two rivers, Seiont and Cadnant. Segontium Roman fort was built in AD 77-78. The fort has had an interesting 20th Century history. The site was saved from builders in 1913, excavated by (Sir) Mortimer Wheeler from 1920-23, purchased by a John Robert’s of Caernarfon who was responsible for erecting the museum, and in 1937 willed by him to the National Trust who in 1958 placed it in the guardianship of Ministry of Public Buildings and Works, who also bought the vicarage area of the site to the south – with a view to further excavation. The SE section was subsequently excavated during the year’s 1975 to 1979. Responsibility for the site now lies with CADW the Historic Environment Service of the Welsh Government. The Museum seems to be managed by a local trust Segontium Cyf. There are references on-line to visitors finding it closed. A Guidebook can be bought at other CADW sites including Caernarfon Castle. Segontium fort faces south-east. In shape it is an imperfect rectangle with rounded corners 550 ft by 470 ft with four gateways. 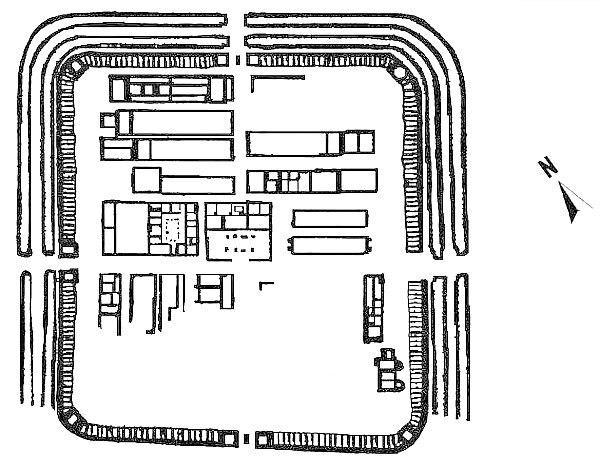 The buildings within are of a standard pattern with some exceptions and closely packed though a clear space (intervallum) which runs around the foot of the rampart separating the buildings from the wall. The buildings are arranged in three lateral blocks with the administrative buildings in the centre. Like other forts of its date the defences were originally of earth and timber as would have been the buildings. Coins relating to the reign of Edward I show the fort was used as a quarry for the building of Caernarfon Castle. A Roman Road connected Segontium with the legionary fortress at Chester (Deva). There are several elements to the visible remains: A wall with backing mound (the original rampart), counterforts on the interior face of the wall, corner turrets, and three gateways – the fourth at the SE having been lost during the laying of the A4085 which crosses the site. The wall dates from about AD 150 and is about 4’ thick at the base. The wall would originally have had a parapet standing in total about 18 feet high. Evidence of the original holes for scaffolding is still visible. The so-called ‘counter forts’ in base of the wall probably allowed access to the parapet via steps or ladders. Some of the turrets are, or would have been solid to carry the weight of a heavy ballista, a spring mechanism to discharge stone balls. The gateways would have been arched to carry the weight of the gatehouse. The gatehouses structure changed over the centuries as threats and needs varied. The internal buildings are of various dates though none earlier than 150 AD. Most show a rebuilding phase in the 4th century AD. Taking the middle section the Headquarters Building (Principia) succeeded an earlier timber structure. It includes an enclosed courtyard with porticoes and flagging, a roofed assembly hall later subdivided to provide additional office space, and a row of five rooms at the rear – the central room being the regimental chapel where the standard was kept. In the 3rd century an underground strong room was built into the chapel. Also in the 3rd century an apsidal room was added at the back of the building possibly to store fort records as it is the only part of the fort to have a hypocaust. The building seems to have suffered from damp much as some buildings do today. There is evidence that the builders tried to find ways of dealing with this! Next to this and to the NW is the Commandants House (Praetorium). Again part of the standard plan. At Segontium the house consisted of rows of rooms opening off porticoes arranged around a small internal courtyard or garden. A room at the rear, which contains a plinth, may have been the base of a shrine. Again traces of the original timber building have been found. Adjoining this building was a large yard and workshop (Fabrica) with a long subdivided shed at the far side. On the other side of the Headquarters Building lay two large granaries (Horrea) measuring 90ft by 19ft built to an unusual design without buttresses and the floor beams taking the entire weight of the grain above. The aim was to store a years worth of grain at each fort. The Roman Soldiers staple diet was bread and biscuits. There were eight long buildings to the rear at either side of the street leading to the northwest gate. Of these buildings most seem to have been barrack blocks (Centurie). The buildings were much altered over the centuries. A similar building in the NE corner may have been an additional granary or store. It was rebuilt in the 4th century as living accommodation. The barrack blocks are of a common design (an L shape) with the officer accommodation at the end and the long section for the men. Wooden particians would have further divided the walled areas. The intention was to house a century of men (actually 80 men) in each block or two troops of 30 horsemen with their equipment. Excavation of the SE corner revealed a surprise. The largest structure was revealed to be a large building with a courtyard, built about AD 140, with en-suite bathhouse. It has been speculated that this was the residence of the Procurator Metallorum who would have been responsible for the extraction of metal ore in the area. The building and bath-house were demolished in the 4th century and replaced by another bath-house complex. Internal bathhouses are a feature of 4th century rebuilding so this in itself was not a surpise. However, it does not seem to have been ever finished in that a hypocaust system was never installed. Archaeological investigations have found a flourishing civil settlement (Vicus) outside the camp. An external bath-house has also been found. 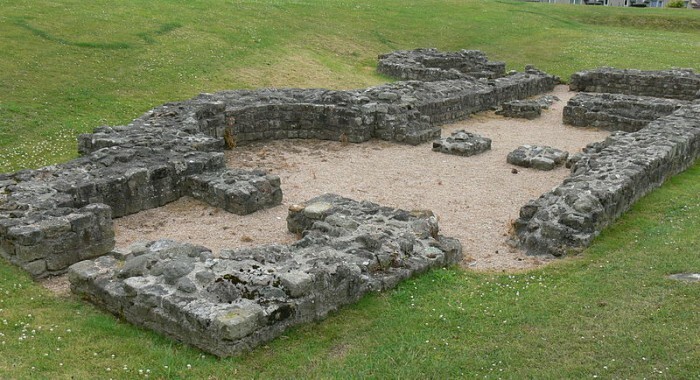 A walled enclosure built around 200 AD (230 foot by 165 foot) known as Hen Wallen (‘Old Walls’) may have had something to do with Segontium’s role as a port. The remains of this structure can be viewed 300 yards west of the fort along the A4085, turning left at Segontium Road South, then right at Hendre Street. 150 yards east of the fort near the church of St Peblig, a temple of Mithras was excavated in 1959. The building measured 48 foot by 21 foot, was partly dug into a slope, and had a slate roof. Again it dates from about AD 200. Mithras an Eastern Religion was popular amongst soldiers. It promoted the fight for good over evil and assured a life beyond the grave. There are no visible remains of the external bath-house, Temple of Mithras, or the Vicus. Taking the historical context Governor Agricola finally defeated the Welsh tribes in Anglesey in an unexpected lightning strike using Auxiliarie Troops, who swam across the Menai Straights with equipment and horses in AD 78. 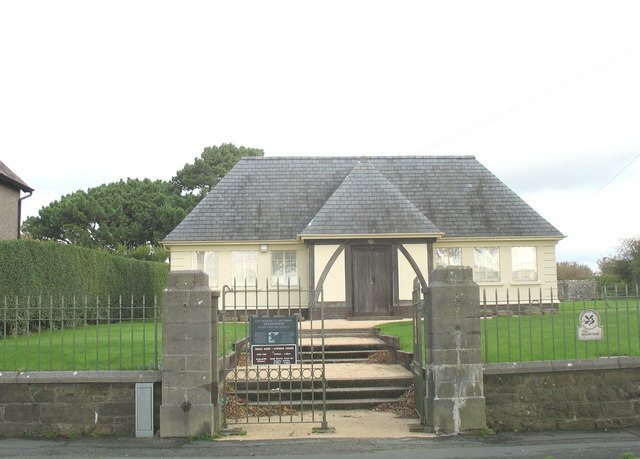 Segontium housed auxiliary troops from about AD 78. The auxiliary troops complimented the legionary troops who were stationed at Chester and Caerleon. Auxiliary troops often retained the traditional fighting skills and arms of their homelands and were not normally Roman citizens – an honour given to them after 25 years service. Auxiliary troops could be infantry usually 500 to 1000 strong or cavalry up to 500 strong. The archaeological evidence suggests that at the very least Segontium was intended as a part mounted military cohort, both by its size, and the existence of what appears for some of the time to be an additional granary. In the early period of the occupation the auxiliaries at Segontium would have been detailed to keep the peace and to ensure continued mineral extraction. An inscription from the time of the Emperor Sepitimus Severus AD 193-211 indicates that, by the beginning of the 3rd century, Segontium was garrisoned by 500 men from the Cohors I Sunicorum, which would have originally been levied among the Sunici, who lived in the Rhine-Musse area, now Belguim. The size of the fort continued to reduce through the 3rd and 4th centuries. 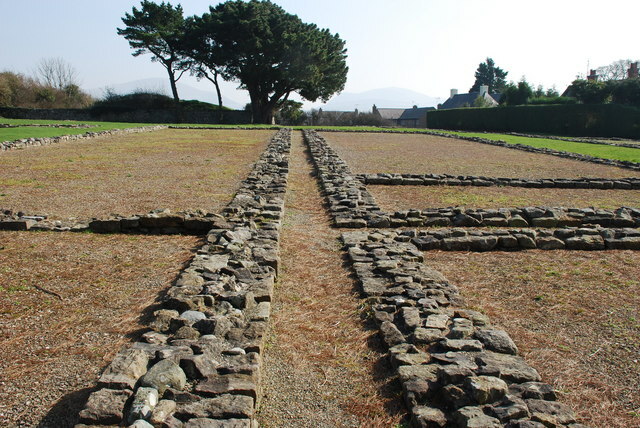 In the 4th century Segontium’s main role was probably the defence of the north Wales coast against Irish raiders. Coins found at Segontium show the fort was still occupied until at least 394 AD. Finally we enter the world of legend covering the late 4th century. Segontium is generally considered to have been listed among the 28 cities of Britain in the History of the Britains traditionally ascribed to Nennius, a 9th century writer, either as Cair Segeint or Custoient – and who stated that an emperor’s inscribed tomb was still present in his day. This monument such as it existed is now ascribed to Constantine, a son of a St Elen, the patron of the Sarn Helen – a series of road networks across Wales. The story of Elen also features in the 12th century Mabinogion Tales featuring one Maximus – in Welsh Macsen Wledig (possibly a reference to the late 4th century Gallic Roman Emperor Magnus Maximus 383-388). According to legend, Macsen saw Elen or Helen in a dream while he slept in Rome or in Wales, then sent out messengers to find her. Some of them eventually reached Snowdonia. Recognising the mountains and valleys Macsen had seen in the dream, they or “he” found Helen. Elen his future wife was the daughter of a Welsh chieftain called Eudaf Octavius. The tomb of her son Constantine (Cystennin) is said to have been moved by Edward I. The legend such as it is probably relates to whatever defences were available to the Romano-British peoples’ after the withdrawal of troops in 410 AD – under pressure from Saxon settlers from the east and Irish invaders from the west. A Celtic saint – St Peblig (Publicius) is said to have established a monastery and church at Llanbeblig – in the late 4th century? And St Peblig is recorded as being another son of Elen and Maximus. St Peblig’s remains the parish church for Llanbeblig. The building we see today is essentialy a 14th-century update of an earlier church built close to the Pagan Temple of Mithras and on a Roman graveyard. The tower was added in the 15th and 16th centuries. Other alterations were made in later centuries, including a major restoration in 1894. 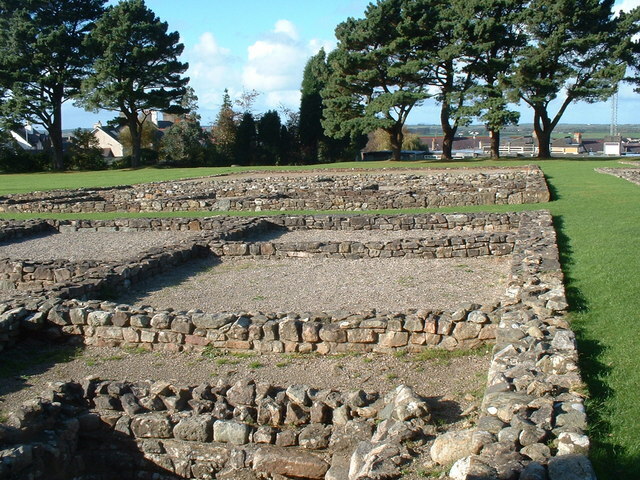 Categories: Roman Sites, Roman Temple | Tags: Segontium Roman Fort at Caernarfon in Gwynedd Wales | Permalink.